Les Portes du Soleil is one of the largest ski areas in the world; it’s made up of 12 different resorts linked across France and Switzerland so there really is something for everyone. 283 slopes: 27 Black, 104 red, 119 Blue and 33 green. 197 lifts which are predominantly chairlifts. 10 snow parks including the all-natural Burton Stash. The Portes du Soleil encompasses 12 resorts, which are all linked to provide you with non-stop skiing all day long. It’s possible to ski an entire circuit of the area in one day with very little time spent on the bus. We’ve already covered Morzine, Avoriaz, Les Gets and St. Jean d’Aulps, but the Portes du Soleil has plenty more to offer. This huge ski area is also made up of the larger resorts of Châtel in France and Champéry – Les Crosets in Switzerland. It also encompasses the smaller French resorts of Chapelle d’Abondance and Abondance, as well as Champoussin, Morgins and Torgon in Switzerland. These smaller resorts are mostly made up of T-bar lifts, drag lifts and old chairlifts so are a lot quieter than the larger resorts, making them well worth a visit a few days after a big snowfall – there’ll be plenty of untracked powder! Book your ski transfers from Geneva to Morzine, Avoriaz, Les Gets and Saint Jean d’Aulps HERE. Châtel is one of the bigger resorts in the Portes du Soleil and is made up of three main ski areas: Pre la Joux, Le Linga and Super Châtel. Pre La Joux is the area you’ll end up in if you drop over the back of the Chaux Fleurie chairlift in Avoriaz, and it’s often pretty quiet thanks to its location on the very edge of the Châtel ski area. However, it doesn’t have that many green runs so make sure you know your ability before dropping in! 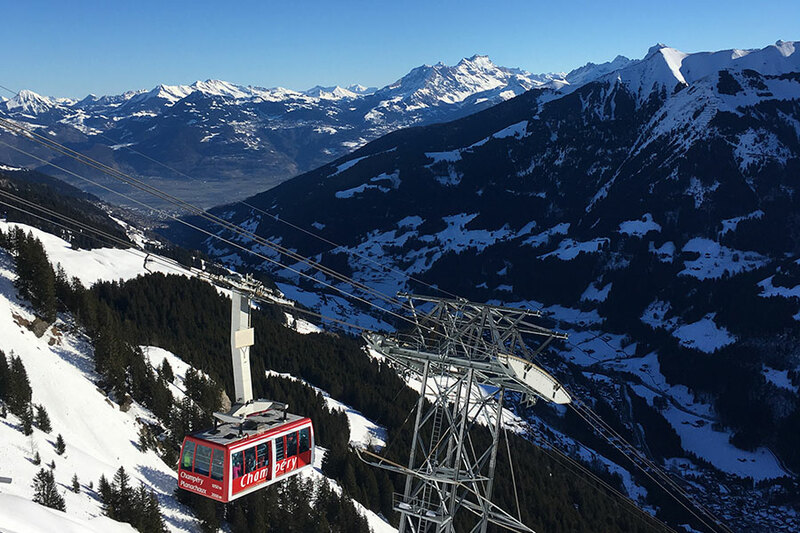 Up until recently Pre La Joux could only be accessed from Châtel by bus, but thanks to two new chairlifts linking it to Le Linga, you can now ski the whole way over to Super Châtel without having to take off your skis. Super Châtel is home to a large snow park that caters to all abilities, while there’s lots of great powder skiing to be had over in Pre La Joux and Le Linga. Châtel is a traditional mountain town, like Morzine, so if you’re looking for somewhere to eat there are plenty of options both in town and on the pistes. Plus, because it’s still in France, your lunch won’t cost the earth. We’d recommend Chez BaBeth in Pre La Joux for one of the most interesting eating experiences you’ll have in France. On the other side of the Mossettes chairlift in Avoriaz lies the Swiss ski area of Champéry – Les Crosets, home to the infamous Swiss Wall. One of the steepest pistes in the world and often covered in huge moguls, it’s a run for expert skiers only, but you can download on the chairlift and watch people attempting to make their way down! Champéry – Les Crosets has a number of high-speed chairlifts and a few drag lifts and T-bars; it’s a pretty small resort but it’s often quiet compared to Avoriaz and really easy to access. There are some really long, mellow pistes that run all the way from Avoriaz to one of the lowest lifts in Champéry, plus you can take the cable car down to the town and have a look around if the mood takes you. Because it’s south facing and quite exposed, the snow tends to melt a lot earlier in Les Crosets, but it’s a great place to spot marmots in the spring. Keep your eyes peeled from March onwards! Champoussin is a small ski area that connects Les Crosets to Morgins, and it’s so quaint that most of the chairlifts operate out of old barns. Because it’s small and out the way, it’s a really good place to go to find fresh snow a few days after a big dump, but make sure it’s sunny because there aren’t many trees! The Swiss resort of Morgins is one of the most far-out resorts in the Portes du Soleil, over two valleys over from Morzine! It’s a quiet little resort town with some great powder skiing and amazing tree skiing for when the visibility isn’t so good. These three resorts are the smallest and quietest in the area, set on the outskirts of the Portes du Soleil. This makes them great places to ski, even on the busiest of days. Expect wide, quiet pistes, friendly lift staff and a vague feeling that you’re skiing in the 1970s. There are barely any houses, apartment blocks or hotels in sight – just beautiful scenery and a peaceful atmosphere. Abondance is the home of famous local cheese, the aptly-named Abondance, so if you want to eat over there make sure you try some – but it’s also available in any of the Morzine supermarkets. Alternatively, you can have lunch at the Restaurant Panoramique in Torgon, which has amazing views of Avoriaz on one side and Lake Geneva on the other. Don’t Forget to Take a Piste Map: While all the resorts in the Portes du Soleil are linked, some of the links can be a bit confusing and it’s easy to get lost. Having a piste map handy means you can always find out where you are and easily work out how to get home. Leave Early: If you venture out past Avoriaz, we’d recommend starting to make your way home before 3pm (especially if you’re skiing in Morgins, Abondance or Torgon), before the lifts start closing. It’s also worth mentioning that if you get stuck on the wrong side of Avoriaz, it’s a long and expensive cab journey home (but if you do get stuck, just call our cab service!). Try to Eat in France: The Portes du Soleil may have around 90 slope-side restaurants, but if you’re in Switzerland be aware that the prices are likely to skyrocket and some of the bars and restaurants only take cash. The cheapest place to eat on the mountain is at the Carrefour supermarket in Avoriaz – it has a fresh bakery section and a microwave so you can heat up any food you buy. But if you’re after amazing views of Mont Blanc, try a picnic on the Pleney plateau in Morzine, or a drink at Le Grand Ourse on Mont Chèry in Les Gets. Make the Most of the Smaller Resorts: While Morzine, Avoriaz and Les Gets can get very busy, particularly in the school holidays, the rest of the resorts in the Portes du Soleil remain relatively quiet. If you get up early and subsequently head home a little earlier, you can miss virtually all the queues if you head over to Châtel, Les Crosets or St. Jean d’Aulps. 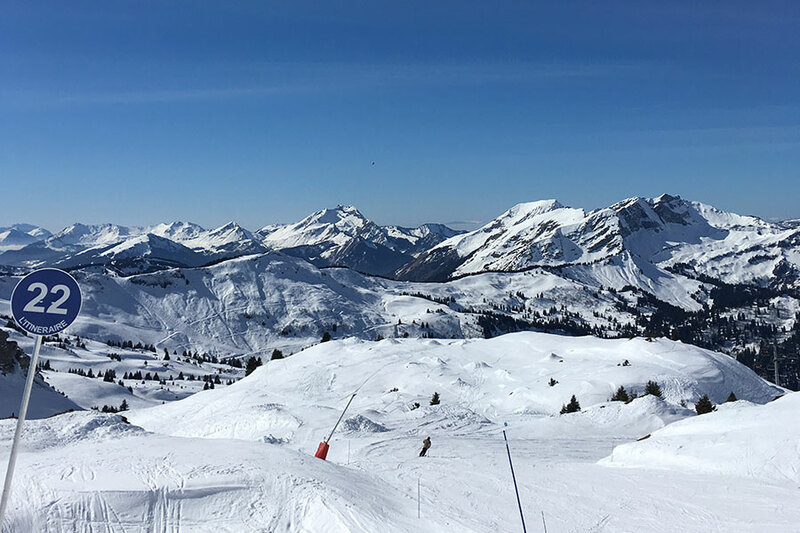 While St. Jean is a bit disconnected from the rest of the Portes du Soleil, the little ski area is great for spending a day away from the crowds and is definitely worth the drive. Book your airport transfers from Geneva to Morzine, Avoriaz, Les Gets and Saint Jean d’Aulps HERE.